The cat flea, Ctenocephalides felis, is one of the most abundant and widespread species of flea on Earth. The cat flea is a small sucking insect of the order Siphonaptera. Adults range from 1–2 mm long and are usually a reddish-brown colour, although this can vary. The cat flea, and all other fleas, are compressed laterally, resulting in an extremely thin insect that can be quite hard to find in an animal’s coat. 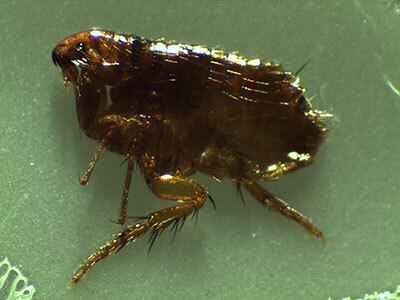 The cat flea’s primary host is the domestic cat, but it is also the primary flea infesting dogs in most of the world. The cat flea can also maintain its life cycle on other carnivores and on omnivores. Humans can be bitten, though a long-term population of cat fleas cannot be sustained and infest people. However, if the female flea is allowed to feed for 12 consecutive hours on a human, it can lay viable eggs. Fleas go through four life cycle stages of egg, larva, pupa, and imago (adult). Adult fleas must feed on blood before they can become capable of reproduction. Flea populations are distributed with about 50% eggs, 35% larvae, 10% pupae, and 5% adults. A few fleas on adult dogs or cats cause little harm unless the host becomes allergic to substances in saliva. The disease that results is called flea allergy dermatitis. Small animals with large infestations can lose enough bodily fluid to fleas feeding that dehydration may result. Cat fleas also may be responsible for disease transmission through humans, and have been suspected as transmission agents of plague. Cat fleas can transmit other parasites and infections to dogs and cats and also to humans. The most prominent of these are Bartonella, murine typhus, and apedermatitis. The tapeworm Dipylidium caninum can be transmitted when an immature flea is swallowed by pets or humans. In addition, cat fleas have been found to carry Borrelia burgdorferi, the etiologic agent of Lyme disease, but their ability to transmit the disease is unclear.